We understand surgery can be stressful. You want your pet to be comfortable and safe – and those are always our top priorities. Our leading edge surgical suite was purpose designed and built to allow our excellent and dedicated surgical team to focus on one thing: The best possible outcomes for the patients our clients entrust to our care. Our Veterinary Hospital puts the safety of your pet first. That means we start by using state of the art veterinary specific vital sign monitoring, IV fluid and heat therapy and the most up to date surgical and pain management protocols in every procedure we perform. When it comes to surgical outcomes, experience matters. 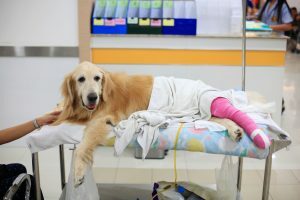 From common spay and neuter procedures to complex orthopedic fracture repairs to the most delicate foreign body extractions, our caring team of surgery veterinarians experts has the judgement and skill to make sure your pet gets the best possible results. In house pre-anesthetic blood work to make sure your pet’s organs are healthy enough for anesthesia before surgery begins, monitor blood oxygen levels, EKG, pulse and temperature continuously during surgery, and gently recover your pet in a warmed, safe and constantly monitored recovery enclosure after the procedure is complete. Elective procedures such as spay / neuter and superficial mass removals can be scheduled easily with any one of our caring and professional veterinarians. For the most technically complex procedures, you may elect to consult our board certified veterinary surgeon Dr. Cynthia Zikes. Dr. Zikes has been practicing for over 25 years and her life long commitment to learning has enabled her to handle the most demanding surgical cases with the experience you and your pet deserve. We treat every patient with the love we would give our own so your pets will have the best chance of getting a great surgical outcome. We also offer soft tissue surgical procedures that improve your pet’s health and comfort. Orthopedic repairs are an advanced surgical procedure to repair bone and ligament damage. Our veterinary surgeons have years of orthopedic experience including cruciate, open/complex fracture and Luxating patella repairs. Cats have unique physiologies and specialized techniques and care are required. Our highly trained and gentle staff of doctors and nurses know how to make the surgical experience as relaxed and pain free for your feline companion. We have a dedicated cat room where they can relax in a calm, bark-free environment and await your arrival to take them home again. At Home Animal Hospital’s Highly trained veterinary surgical team want the best for your pet – just like you do. We have found the best outcomes can be achieved when we all work together to form a surgery, recovery and rehabilitation plan which you are a part of creating and believe in. When dedicated experts armed with the best veterinary technology and the latest thinking get together with the love of a committed animal parent – great results can be achieved. Pain management is critical to ensuring the best surgical outcomes. At Home Animal Hospital uses state of the art Cold Laser Therapy and the most up to date pain management protocols to ensure fast healing and minimize discomfort. Come see how veterinary medicine should be. Call (808) 873-0102 to talk to talk to a veterinary surgeon. Tell us about your pet's condition and the best time to contact you. Preferred date and time of appointment you would like to bring your pet for a medical evaluation.